Ginger tea is a natural remedy that can help assist you in managing certain health problems and maintain better overall health. There are many major and minor health problems people may have to deal with throughout their lives that can be managed with medication. Some common types of health problems that people will have to deal with include colds, headaches, inflammation, body pains, etc. Many of these health problems have natural remedies that you can use instead of using medication, such as ginger tea. There are several benefits to drinking ginger tea, which makes it a beverage with many different uses. Ginger tea is a natural remedy people can use for different purposes, but you may not be aware of what it is. Ginger tea is a drink that is made with a plant called ginger, which can be grown around the world. According to healthline.com, ginger is a plant that is native to southern China and can grow anywhere in the world with a warm climate. It is a plant that can grow in most countries, which makes it a useful plant for people to use around the world. The many uses for this plant can include putting it in drinks, food, products, and much more. Ginger is a spicy and aromatic plant that can be used to provide flavor for cooking and soothing properties in medicine. The spicy and aromatic features of the ginger plant are what make it extremely useful for many people. One use for ginger is using it as a spice for flavoring food or drinks with one drink being tea. A simple way to make ginger tea is to put ginger in boiling water, which you can then drink. Ginger tea is a drink that people throughout the world use and it can provide many health benefits. Ginger tea is a drink with certain health benefits and it can be used to help treat certain health problems. The ginger plant contains oils that gives it many medical purposes, which is what makes drinking ginger tea beneficial. Listed below are a few benefits to drinking ginger tea. One major use for drinking ginger tea is that it can help with your digestion system, which can be helpful for a few issues. Ginger can help empty your stomach faster and this why it can improve your digestion system. It can help your body break up and get rid of intestinal gas so that you are more comfortable. The medical uses for drinking ginger tea can include getting rid of indigestion and conditions associated with indigestion such as bloating. Ginger tea is something you can use in moderation to assist you with your digestion system. Drinking ginger tea can improve your respiratory system so that you can breathe better. Ginger can provide anti-viral protection, which makes it useful for many health illnesses that can affect your respiratory system. Ginger can help treat respiratory viruses, strep throat, cough, flu-like symptoms, and other similar illnesses. Drinking ginger tea can be a good first step to treating many respiratory illnesses so that you may be able to avoid using medications. Ginger tea can also be useful for people who have a compromised respiratory system such as children and the elderly. This kind of tea can also help with inflammation, which can cause many different health problems. The two aspects that make the ginger plant useful for many people are its anti-inflammatory and analgesic properties. Reducing inflammation can help you avoid, as well as treat, conditions such as arthritis, heart disease, and osteoarthritis. Arthritis can be a debilitating condition that causes people to feel a lot of pain and it is important to treat the pain. Drinking ginger tea can be useful for people who suffer from arthritis. Ginger tea can also be helpful for lowering blood sugar levels, which can help prevent you from developing certain diseases. Having high blood sugar levels can cause serious diseases such as diabetes and pre-diabetes that can lead to additional health problems. Ginger is a natural plant that can help lower blood sugar. Plus, drinking ginger tea is helpful for those who have diabetes because it can help control your blood sugar levels. It can help prevent diabetes as well as help you manage your symptoms of existing diabetes. Drinking ginger tea can also reduce your chances of getting heart disease by lowering certain health risks that can cause this disease. One health factor that ginger can help improve is cholesterol levels so that you can lower your chances of getting heart disease. Heart disease is a major health problem that is responsible for many deaths and it affects many people. This is a major benefit to drinking ginger tea. After all, heart disease can lead to several debilitating health problems. It may not completely eliminate your chances of getting heart disease, but it is a natural remedy that can help. Muscle pain is common at some point in everyone’s life. Luckily, ginger tea can help. The ginger plant has analgesic properties that allow ginger to provide similar effects of painkillers. Drinking ginger tea can reduce muscle pain but it will not give you instant relief. You can drink ginger tea daily in order to maximize the pain-relieving properties that ginger offers. Overtime, this can lead to less muscle pain. Muscle pain is a common problem that many people have, and ginger tea is a possible natural remedy for it. Nausea is another common problem that everyone will face at some point throughout their life and you may be looking for a natural remedy for it. Ginger tea is one example of a natural remedy that you can use for nausea caused by different conditions. You can drink ginger tea to alleviate nausea caused by morning sickness in pregnant women; as well as for nausea caused by chemotherapy, seasickness, and much more. Ginger tea offers a versatile natural remedy for nausea, which makes it useful for many people. You can drink it if you suffer from nausea often so that you can have relief from it. Ginger tea can also be a useful drink for women who get menstrual cramps because it can provide relief for them. Menstrual cramps are a condition that can cause many different discomforts for women, such as bloating, cramps, a painful abdomen, and so forth. As mentioned earlier, the ginger plant has analgesics properties that allow it to provide you with pain relief from many conditions including menstrual cramps. This may even help you avoid using medications like ibuprofen to relieve the pain or discomfort caused by menstrual cramps. Drinking ginger tea can be a useful remedy for women who suffer from menstrual cramps often and it can be used on a daily basis. There are some more uses that ginger tea can have for more serious health conditions and these effects are more preventative. Ginger is a natural blood thinner because it has salicylate to help prevent blood clots that can cause serious health problems. The health problems that can be caused by blood clots include heart attacks and strokes, so it is important to find ways to prevent them. Drinking ginger tea may be a good remedy to use that can make your blood thinner, which can be useful for people who have high blood pressure. 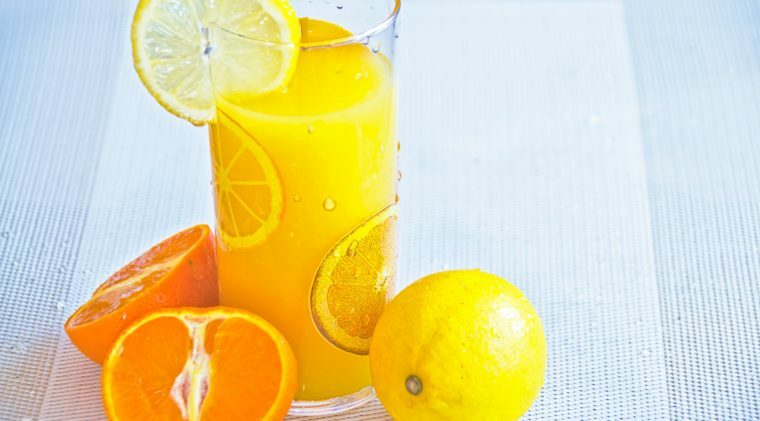 This is a simple natural remedy that you can drink to help prevent a heart attack or stroke. In addition, ginger tea is helpful for weight loss because it can suppress your appetite and make you feel fuller. Weight problems can cause many health problems such as heart disease and can make a number of conditions worse, such as diabetes. Ginger has properties that can help reduce your hunger for up to several hours, which can help you control what you eat. Ginger tea is a natural drink that can be beneficial to those seeking to lose weight, so they can prevent or improve their health conditions. It cannot be the only thing you do for weight loss, but it can be a good natural drink to use alongside diet and exercise. Ginger tea has many positive health effects but there are a few downsides to drinking too much of it, like with anything else. There are not many side effects to consuming ginger, but it is recommended that you do not drink or eat over 4g of ginger a day (Carey, 2017). You should be fine drinking ginger tea as long as you do not consume more than that amount of ginger. Ginger is a spicy plant, so naturally it can cause heartburn, or it can upset your stomach if you consume too much of it. This makes it important for you not to consume too much ginger so that you do not experience either of these discomforts. Do not consume too much ginger if you have stomach conditions because it may create more discomfort for you. You may already be susceptible to heartburn or an upset stomach so consuming ginger in moderation would be best. You may also not want to drink ginger tea if you have an allergy to ginger, which can cause irritation in your mouth or stomach. Additionally, it is important for people with bleeding disorders to not consume excessive amounts of ginger since it is a natural blood thinner. Overall, there are not many side effects to drinking ginger tea as long as you do not drink it in excessive amounts. There are many different brands of ginger tea available to buy. They are made with different ingredients that can have more or less health benefits. 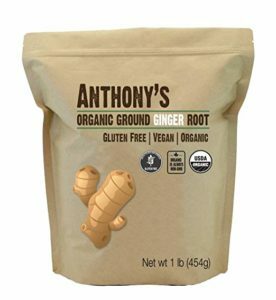 One product that you can buy is Anthony’s Organic Ground Ginger Root. It is a powder that you can put in hot water to make ginger tea. This can be a good product for people who have an allergy or sensitivity to gluten, so they use it without worrying about being affected. Ginger can be a good anti-inflammatory option with antioxidants, which makes this a good powder to use in tea. You can have an anti-inflammatory and antioxidant rich tea without worrying about having a reaction to gluten. Plus, this ginger root powder can be used in baking or cooking, which gives it many different uses. It is made with a good taste so that it can be used for tea or for food such as cookies, doughnuts, pancakes, chicken, pork, and much more. This product contains the essential oils of ginger that can have certain health benefits, like easing stomach discomfort and stimulating digestion. This means you can have a great tasting ginger powder with many benefits. It is an organic product that is certified by the USDA. Two key features are that it is gluten-free and non-GMO. You can purchase this ginger tea if you are looking for a drink with many health benefits. It can be especially useful for people who are sensitive to gluten. 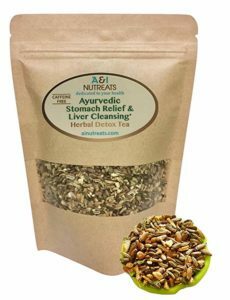 Another ginger tea that we recommend is Ayurvedic Stomach Relief and Liver Cleansing Herbal Detox Tea. 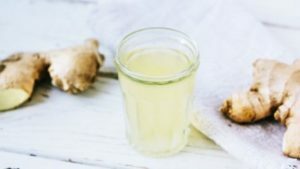 The four health benefits that this ginger tea can provide you with are: heartburn relief, stomach acidity relief, liver cleansing, and better digestion. This gives you a few health benefits all in one tea, which can make this a product worth purchasing. It is also a completely natural and non-GMO product that contains no caffeine, gluten, sugar, or preservatives. These facts allow you to be confident that you are purchasing a natural ginger tea with no ingredients with bad side effects. This tea contains milk thistle, fennel, ginger, peppermint, and licorice. All of which combine to make this a quality drink. The milk thistle is an antioxidant that provides relief from inflammation. In addition, fennel provides digestive relief, while peppermint provides stomach relief, and licorice provides relief from inflammation. This product can maximize the relief you can have from inflammation with the ginger and other ingredients having anti-inflammatory effects. It also has a few ingredients that combine to maximize the relief you can have from stomach issues such as heartburn, cramps, gas, bloating, and indigestion. 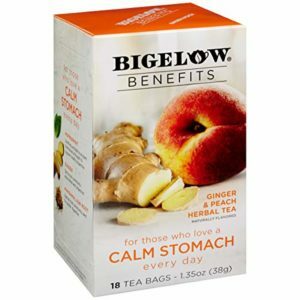 Another ginger tea packed with health benefits is Bigelow Benefits Ginger and Peach Herbal Tea. This is one of many different brands of ginger tea that you can choose, and it can give you certain health benefits. Bigelow is made with ginger, peppermint, fennel, licorice root, and peach, and all of these ingrediants combine to provide different health benefits. These are all-natural ingredients so that you can be confident you are drinking a natural tea. It can be good having a natural drink that can provide you with certain health benefits, so you can avoid using medications. The ginger gives this tea a soothing element and the fennel gives it stomach calming effects. Being able to maximize your stomach relief without medications that have certain side effects can be helpful to improve your health. The peppermint, licorice root, and peach allow you to drink a ginger tea with health benefits along with a good taste. This product can be a good choice if you are looking for a tea that can give you stomach relief. 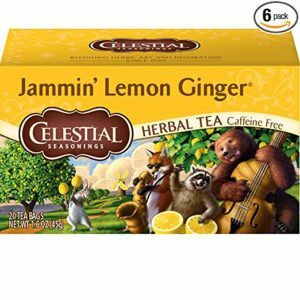 A natural ginger tea that you can drink is Celestial Seasonings Jammin’ Lemon Ginger, which is a quality option. This tea is infused with ginger and it is easy to make. All you need to do is put it in hot water for 4 to 6 minutes. You can have an easy to make ginger tea with all the possible health benefits of ginger. You can be confident that this is a natural tea because it is made with no caffeine, gluten, artificial flavors, artificial colors, or artificial preservatives. This is a natural ginger tea that has a good flavor and gives you the health benefits you are looking for. Want to make your own ginger tea? 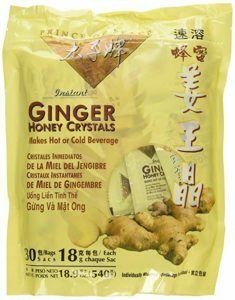 Prince of Peace Instant Ginger Honey Crystals let you make your own ginger tea at home. It comes with 30 packs and each pack has concentrated extract of 12g of raw ginger. Raw ginger can maximize the health benefits that you get from consuming ginger, which makes this a more powerful tea. This tea helps with digestion and provides temporary nausea relief. It can be mixed with hot or cold drinks, and it has no artificial additives. This is a natural product you can buy that can provide you with better digestion and nausea relief. 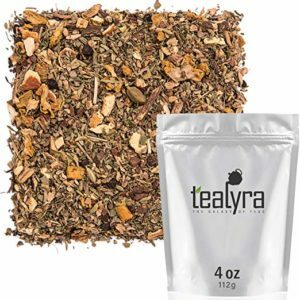 Another ginger tea that has a few ingredients that can provide you with many health benefits is Tealyra Holistic Health Tea. It has many other beneficial ingredients besides ginger including fennel, licorice, and turmeric that all combine to give this tea multiple purposes. Having multiple health benefits can make this a quality tea for you to drink and will make it worth the purchase. This tea has relaxation, anti-inflammatory, blood sugar balancing, and cleansing effects that can provide you with health benefits. It can also be used as a natural painkiller, which can give you relief from pain without needing to use medications that have side effects. It also can help soothe irritated throats and it can help aid in digestion, which are some added benefits to drinking this tea. This product is naturally flavored by herbs and spices. It is flavored with natural cinnamon and black peppercorn along with ginger, which makes it a good tasting tea that can also improve your health. You can be confident you’re drinking something that is natural with no ingredients that will lead to other problems. It is a good option if you are looking for a ginger tea that can provide you with many different benefits. 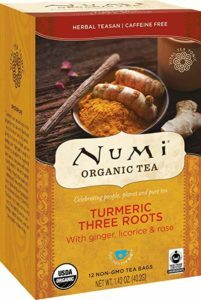 You can purchase Turmeric Three Roots by Numi Organic Tea if you are looking for a tea that has ginger. This tea is made with turmeric, ginger, and liquorice. All of these ingrediants mixed together give this tea flavor and anti-inflammatory properties so you can have relief from inflammation. It is USDA certified and organic non-GMO. Plus, it contains no gluten, artificial flavors, fragrances, or sugar. 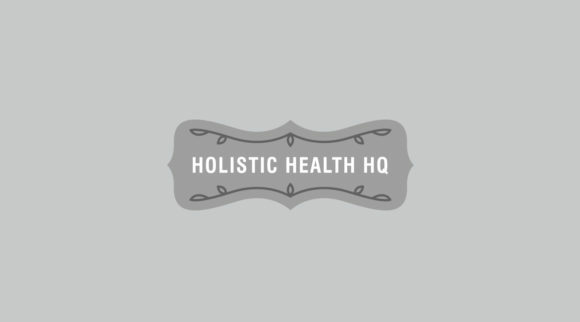 You can be confident that you are purchasing a product that is completely natural and offers anti-inflammatory effects. This is one of the many quality teas you can buy that contains ginger, so you can have the health benefits of ginger. 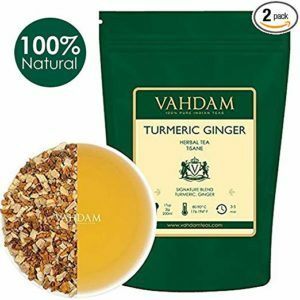 Another ginger tea option for you to choose is Vahdam Turmeric Ginger Herbal Tea. This tea contains turmeric and ginger which both provide different health benefits. Turmeric is an herb that is an antioxidant, which can provide you with some health benefits that can improve your health. Ginger has many health benefits of its own so combining it with turmeric can give you many health benefits. It is considered a natural detox tea and it has many health benefits that can make this product worth purchasing. This tea is made in India with natural ingredients. Therefore, you can be confident you are buying a natural product. These health benefits are available with medications that may have side effects so being able to drink this tea can help you avoid those side effects. It also comes with a 100% moneyback guarantee, which allows you to return it if you are not satisfied. This tea can be a good option for you if you want the benefits of ginger along with an antioxidant. 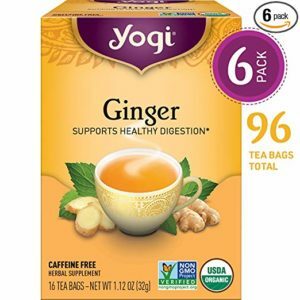 Another brand of ginger tea that can be a good option for people who are seeking a drink with health benefits is Yogi Ginger Tea. This tea is made with ginger, lemongrass, licorice, black pepper, and peppermint. This mix creates good flavor and provides certain benefits. The main health benefit that this product offers is improved digestion, which can be helpful in preventing discomfort caused by poor digestion. This can be especially helpful if you suffer from poor digestion so that you can have a possible natural remedy. It is a quality tea for you to buy because it has a good taste along with the fact it supports healthy digestion. Plus, Yogi Ginger Tea is a natural drink that is USDA certified organic and non-GMO. Other key factors that make this a great natural tea include: it has no caffeine, artificial flavors, gluten, or sweeteners. 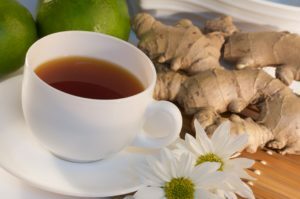 All of these factors allow you to be confident that you are purchasing a natural ginger tea to improve your digestion. It is recommended that you boil water for seven minutes and use two tea bags so that you can maximize the effects of this tea. This would be a natural and quality tea for you to choose if you are looking for a natural remedy to improve digestion. Tea is a yummy natural drink and there are many kinds of teas with unique health benefits. Ginger tea is a type of tea that offers a few health benefits and there are many different brands made with other beneficial ingredients. This type of tea can be used to improve digestion, improve your respiratory system, reduce inflammation, lower blood sugar, and much more. Many of these brands provide a great tasting natural ginger tea that you can drink in the comfort of your home. 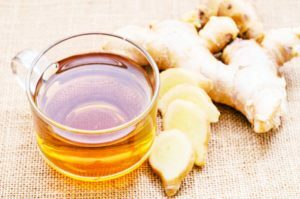 This article has shown you the health benefits of ginger tea and different brands you can use so that you can find the one that is best for you.